because I'm not buying a cat right now) flushed every fluid and changed every filter and changed spark plugs (I work at Toyota so it cost me very little to do so). I'm sure this lil box will last a long time. If it had more power I'd drive it myself. Present mileage 60,000. Still averaging 30 MPG. It's in very good condition (including tires) so I think I could sell it today (2/28/19) for about $4,000.00 - $5,000.00. installed directional arrows in left and right door rear view mirrors. New windshield because of scratches. oil and filter changes every 6000 miles. AC compressor condensate leak in cabin driver's side: required snaking the condensate drain tube to eliminate overflow. Replaced both windshield washer nozzles due to clogging. I recommend snaking a 3/8" fresh water hose down to the bottom of the washer fluid reservoir to flush out slime that clogs the washer pump screen filter (perhaps it's a heat-bacteria thing here in Hawaii). Given the reliability and remarkable low repair costs and I'm very happy with my xB; I'm thinking of keeping it for another 10 years. Re: windshield washer. Make it so water comes out first before first swipe of blades. Presently the blades grind dust into the dry glass before the first spray of water. Use different material for dashboard and doors. The present dimpled plastic material scratches too easily. Use different material for seats, they are hard to clean. Make trip-mileage and clock numbers larger, they are hard to read under certain lighting. Make the turn signal indicator noise louder; it's too easy to forget they are on. Add disk brakes to all four wheels as with the '07. I would have bought an '07 except for its higher MPG. I think Toyota blew it when they changed the '06. It was fast becoming cult-like with the younger generation. I had hoped that Toyota would adopt the early VW trend of the same body each year with minor performance changes only. Cudos to the Toyota-Scion employees for the excellent product. I'm new to this group and happy to be here. 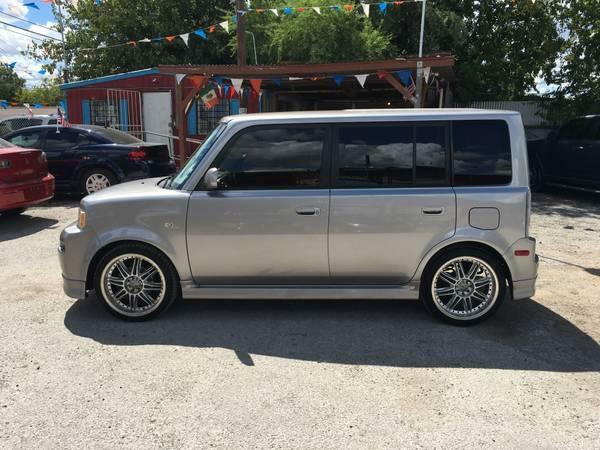 Just purchased a 2005 Scion xB with 131,700 miles on it. 2 owner car, I'm the 3rd. Second owner replaced brake pads all the way around, rear drums, both front wheel bearings, Muffler, Windshield, WeatherTech floor mats front/Rear. Never thought I would buy a Scion xB but the car has grown on me after only a day. My wife and I are fighting over who gets to drive it to work. Overall for a car that has lived a partial life in Michigan there is no rust on it at all. Previous owners mechanic said he thinks the car came from Arizona as some spots on the body are sun faded. Loving this car so far! Last edited by MR_LUV; 03-27-2019 at 12:16 PM. Welcome to the club! Sounds like your xB is just getting broken in. Take care of it and you'll see 200,000 or more easily. I say that because my first 2006 xB - now owned by my ex - just turned 200,000 and has had the living snot whipped out of it by her for the last 100,000 miles. And it's still running great. 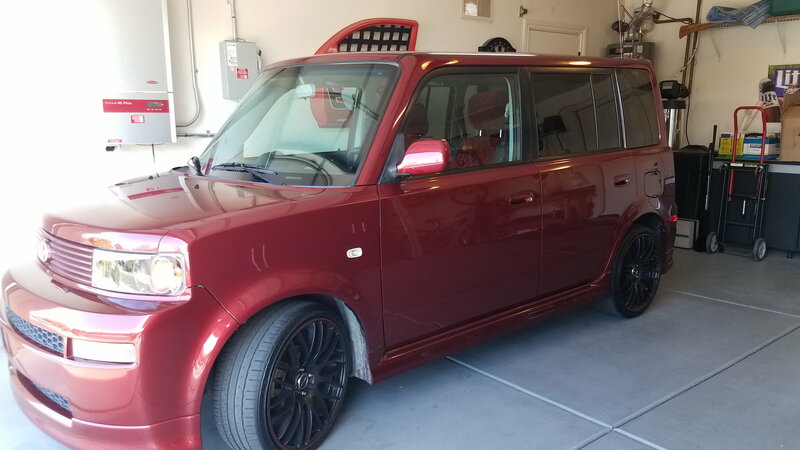 My current 2006 xB just turned 111,000 miles and still drives like new. When people ask me, I tell them it's hands down the best car I've ever owned. Thanks 2stroked! Every time I look at it I bust out laughing but their is a charm to this car. I have fallen in love with it, so has my wife so now we are fighting over who will be using it as the commuter car. I'm planning an oil change and coolant flush on it soon. Good to hear yours is still going strong. I love every aspect of the xB. I fly Drones and the rear cargo area with the seats folded is awesome! I'm no youngster(mid 50's) and should be driving my 2017 Equinox but the xB calls to be driven. I know exactly how you feel. I bought my first one when gas prices first spiked big time. I was looking for maybe a used Tacoma at a local Toyota dealership and my son and I walked by a row of 3 used xB's. I kept right on walking, but he checked them out and found one to be open. He called me over and said "You might want to sit in this thing. It's huge inside." I'm 6' 1" and I couldn't believe the room in it. We came back the next day and drove it. To say it was gutless would be an understatement, but there was just something to it. Over the next year we lowered it, added a rear sway bar, changed the exhaust, added larger wheels & tires and general made it handle like it was on rails. It still wasn't fast, but boy was it fun to drive! I sold that one to my son's mom at 100,000 miles when I bought another '06 with only 31,000 miles on it. I quickly did all of the same mods to this one and more. I drive 38 miles each way to work every day and get 34 MPG while having a ball. Of all of the vehicles I've ever owned or driven in my 63 years, none have ever had so many people take pictures of them. Of course the license plate helps! I didn't get too crazy with summer rubber. I run 205/50-16 General G-Max tires on 16" x 8" wheels. Ok cool. I’m looking at sporting some new wheels for the Scion as well. For now I’m going to keep the steel wheels and hubcaps on. We are going into Summer so if I find a really good deal on some wheels I’ll push the buy button on them. I've had my '06.5 box since it had about 2k on it, bought it in July of '07... it now has 244k and still looks & drives great! 1st set of front brakes lasted 105k, changed the back once. Tires & plugs 3 times and regular oil changes I've done myself. Alternator went bad around 150k, changed it myself also. Power steering belts been a PIA a couple times. Battled the O2 sensors and ultimately the cat about 100k ago. Only thing I had to take it somewhere for was the rear brake line had rubbed on the exhaust till it leaked, which was my fault. Shocks about 60k ago and replaced some bushings in the front end, also myself. In all, HANDS DOWN THE BEST CAR I'VE EVER OWNED! And possibly parting ways with it now. Nice looking xB Puz! The mileage on yours is reassuring as I am hopeful to get as many or more out of mine. 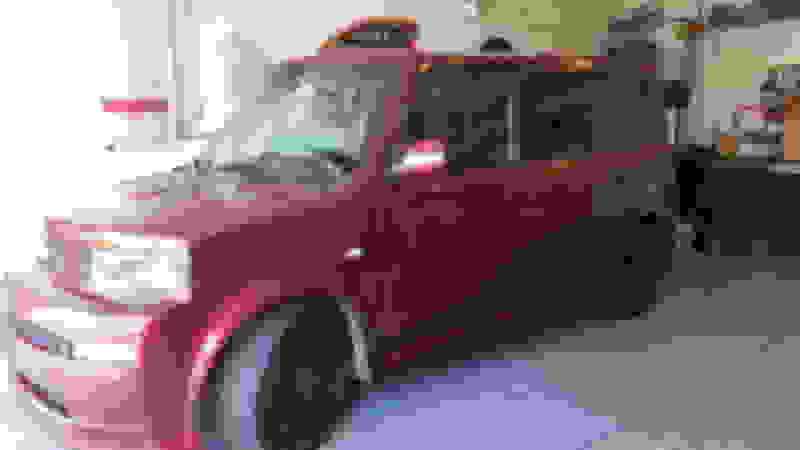 I was happy to hear the previous owner of my xB had a mechanic look at it before he purchased it and has kept up on the maintenance when I bough it. It isn't a perfect xB but it is not bad either. The interior is in really good shape. So if you are parting ways with you xB, what vehicle is going to be next in the garage? This box and from what I can tell most of them are SOLID, and surprisingly easy to work on if you do your homework and take your time. I also loved that the undercarriage was powder coated and still looks amazing, salt isn't bad in KY but do spend a fair amount of time in NE Ohio during the winter. Parts are still fairly cheap and easy to come by also. Did forget to mention that I've had the windshield replaced probably 5 times, but these cars are known for that. I also did my own fix to the rear hatch latch to reinforce it, the stock plastic and mounts were probably the poorest design on the whole vehicle. The new vehicle, I went a little bit outrageous, wanted something 4-wheel drive so picked up a Jeep Grand Cherokee Overland with a Hemi Love the power and comfort, but it's a GAS PIG! May just hold on to the box for commutes lol. Dealer was only going to give me 1500 on trade in, knew I wouldn't get much with the miles on it but too solid of a car to let go for that. Hope yours provides you with many more miles, and it should. Thanks Puz! Hoping my xB gives me many miles without problems as well. I almost bought a Jeep Grand Cherokee with a Hemi engine. I got turned off by it due to the gas prices here in Michigan going up. We will soon get a 49 cent increase in gas tax which will drive our 87 octane to almost $3/gallon. Ridiculous but hopefully my xB will have smoother roads to travel on in return. My wife and I are fighting over who gets to drive the xB to work. I leave first so I can grab the keys and go, LOL!!! Good to see another low mileage xB. I bought mine on 11/13/2004. It has been getting my attention lately, just installed a new CarPlay stereo, installed a usb into the switches area (looks factory). Runs and looks the exact same as it did the day I bought. My other vehicles, not so much, granted, I can't go 0-60 in 4 seconds with the top down or off road, but the amount of $$$ to upkeep them vs the xB is amazing. Won't ever give it up, simply not worth it. Would love to locate some cold cathode lighting that I never pulled the trigger on as well as maybe CAI. 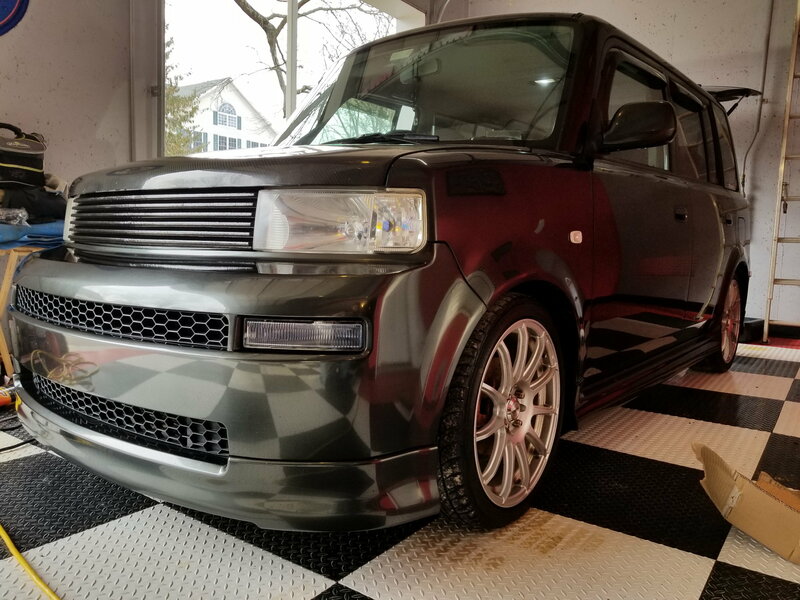 Original owner of this 2006 XB with 105,000 miles. Other then basic maintenance, this car has been trouble free up until about a month ago. Driver side window and door lock has stop working intermittently. Clear coat on paint has started to fail on roof and hood. Here's a blog post about mine from 2 years ago....not much has changed. Reaching out to Clazzio owners! Is your Radio/CD equalizer set to xB or xA? 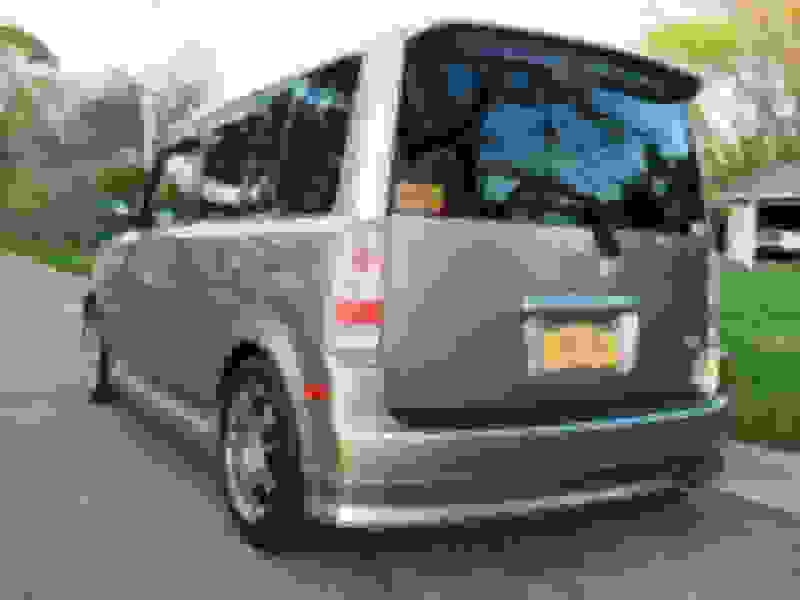 Quick Reply: Scion xB Classic..How is yours holding up?